Sabudana vada is a traditional Maharastrian snack eaten during fasting / upvas. 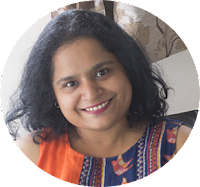 I was trying to avoid potatoes in my diet, so I replaced it with chickpeas or kabuli chana. 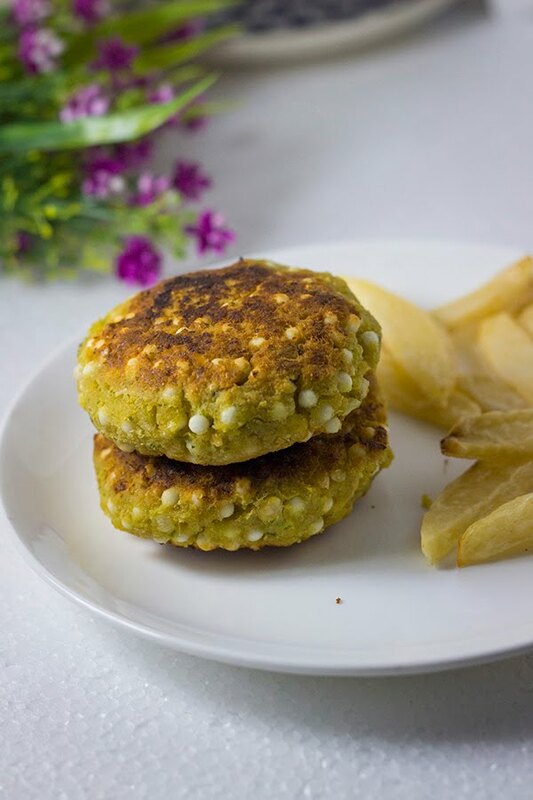 This vada (patty) is a fusion between the traditional Sabudana Vada and the Middle Eastern Falafel. Although both the original snacks are deep fried, I shallow fried. Deep frying definitely makes them tastier, but then, doesn't it always do it? I watched an older episode of Eat Street on TV, where they showed a truck that deep fried Cup cakes. I wonder how that tastes. The chickpea in the vada increases the protein content of the vada. It also adds a nuttiness to it. You can eat it just as it is or add it in a burger like I did. I used the dry chickpeas that I soaked overnight, you can replace this with canned chickpeas as well. The sabudana or the sago pearls sold in supermarket are dried. They need to be soaked to fluff up and become spongy. You can add spices to enhance the flavor. All the work in this recipe is during the preparation stage, the cooking is actually a no brainer - grind, mix and fry. That's it! This vada is vegan and gluten free. 1) Soak the kabuli chana or chickpeas in 3 cups of water overnight.Drain the water and keep aside. You can use canned chickpeas as well. Skip the above steps if using canned chickpeas. Wash and drain the canned chickpeas. Use 2 cups of canned chickpeas. 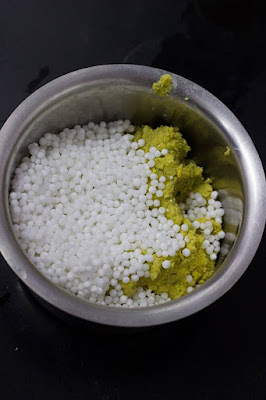 2) Soak the sabudana in 2 cups of water and leave aside for 1/2 hour.Drain the water and cover and keep it aside for 2 hours.If you plan on making this for breakfast, then after draining the water, cover and keep it aside overnight. 3) Grind the peanuts into a coarse powder. 4) Grind together the chickpeas and green chillies coarsely. 5) Add the ground peanuts, sabudana, curry leaves, coriander leaves and salt and mix well. 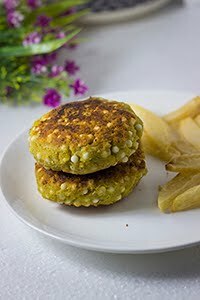 6) Shape into patties / vadas. 7) Heat around 2 Tbsp of oil in a shallow pan for shallow frying. You can decide to deep fry it too. 8) Once the oil is hot, add the vadas to the pan and cook on medium heat. 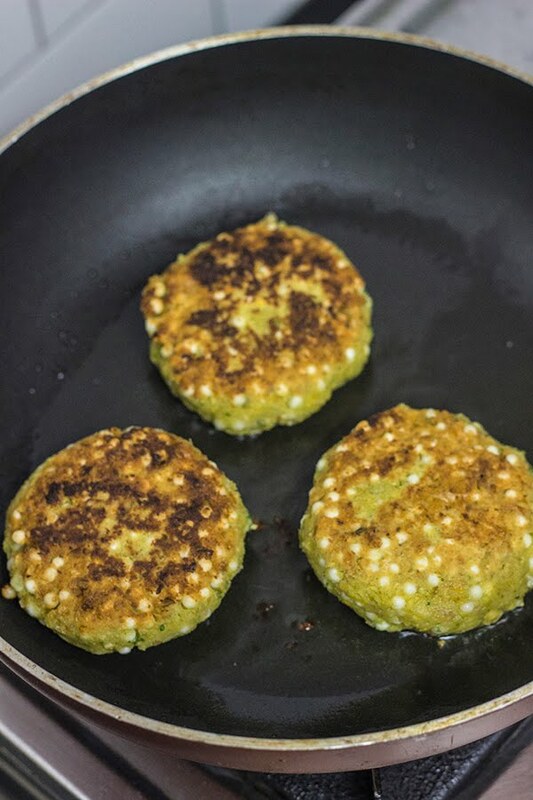 9) Flip the vadas when the first side is browned and cook it until the other side browned. 10) Serve hot with coriander chutney or ketchup. 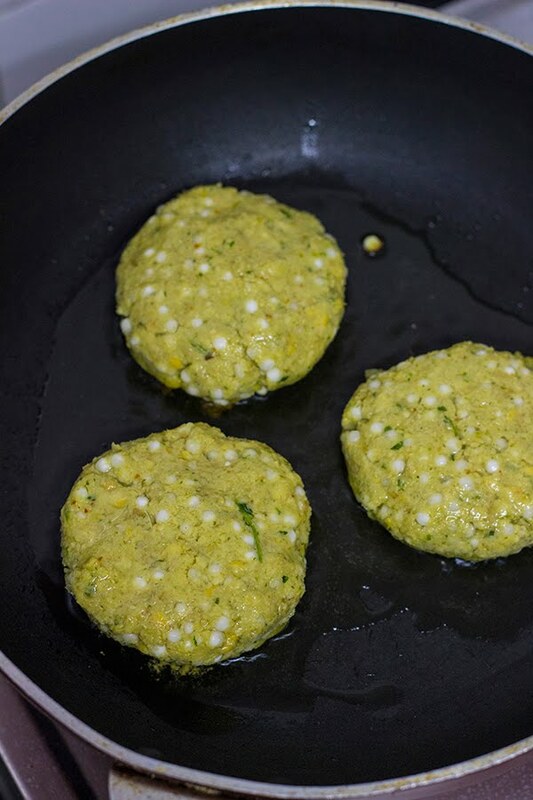 Pan fried patties/ vada made with sabudana (sago pearls) and kabuli chana (chickpeas). Vegan and gluten free. Soak the kabuli chana or chickpeas in 3 cups of water overnight. Soak the sabudana in 2 cups of water and leave aside for 1/2 hour. Drain the water and cover and keep it aside for 2 hours. If you plan on making this for breakfast, then after draining the water, cover and keep it aside overnight. Grind the peanuts into a coarse powder. 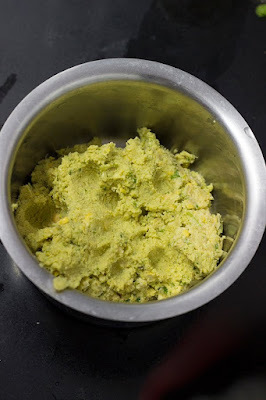 Grind together the chickpeas and green chillies coarsely. Add the ground peanuts, sabudana, curry leaves, coriander leaves and salt and mix well. 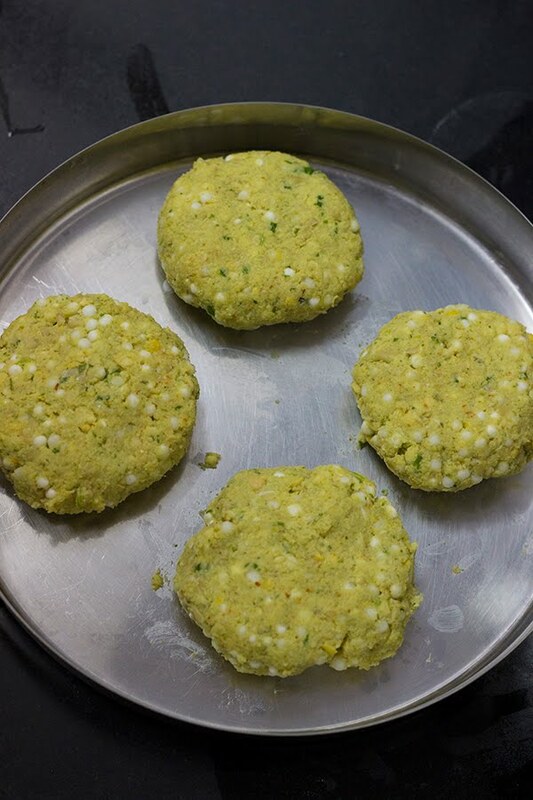 Shape into patties / vadas. Heat around 2 Tbsp of oil in a shallow pan for shallow frying. You can decide to deep fry it too. Once the oil is hot, add the vadas to the pan and cook on medium heat. 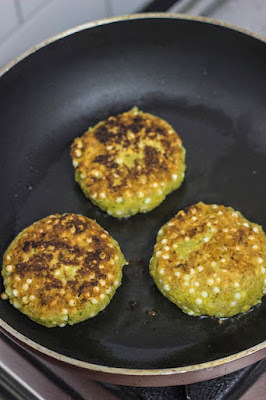 Flip the vadas when the first side is browned and cook it until the other side browned.